Successful waterfowl hunters!!! Here is an awesome football snack food, perfect for the Super Bowl! I would even substitute the cheddar cheese with cream cheese and try it with duck, too. Okay, now I’m hungry–gotta go. Enjoy. Take a slice of cheese and stuff it into a pepper half. 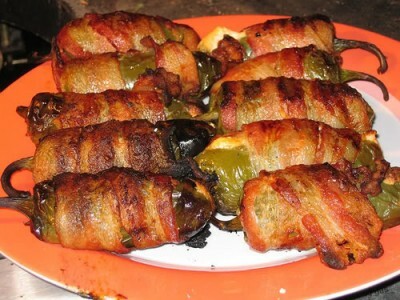 Wrap cheese stuffed pepper with a slice of goose and then with bacon. Secure with toothpicks. Cover grill with foil. Cook poppers over medium heat until done.